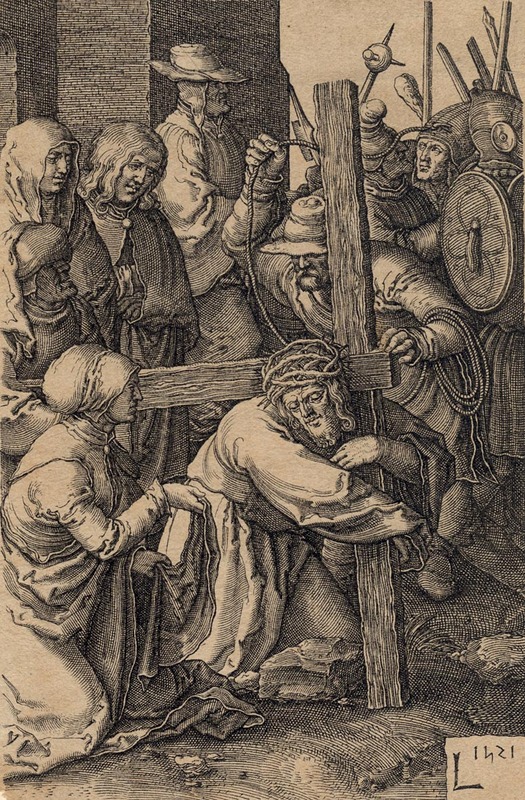 “The Bearing of the Cross” (Le portement de croix), 1615-20, after Lucas van Leyden’s (aka Lucas de Leyda Hollandus; Luca Dolanda) (c1494–1533) plate 9 of the same subject dated 1521 from the series of 14 plates, “The Passion after Lucas van Leyden”. 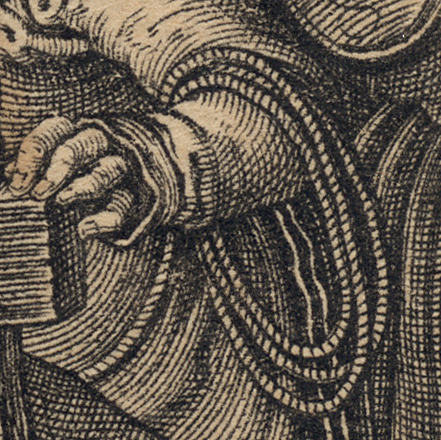 Engraving on fine laid paper trimmed along or within the platemark. Condition: crisp and well-inked impression trimmed along or within the platemark, slightly aged-toned/yellowed with a chipped lower-left corner and attached at the top of the sheet to a support (wove) card. 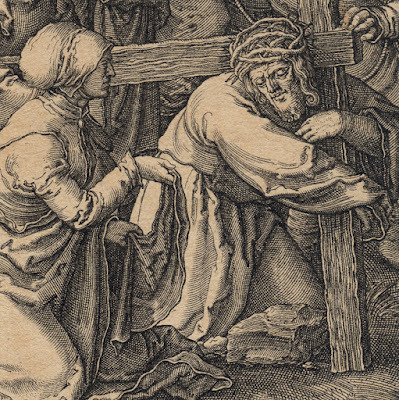 I am selling this important engraving by one of the major Flemish old masters, Jan Harmensz Muller, reproducing in minute detail the engraving of the same subject by the almost legendary German printmaker, Lucas van Leyden, for the total cost of AU$430 (currently US$346.66/EUR288.77/GBP256.01 at the time of posting this listing) including postage and handling to anywhere in the world. If you are interested in purchasing this masterpiece of early 17th century reproductive engraving, please contact me (oz_jim@printsandprinciples.com) and I will send you a PayPal invoice to make the payment easy. 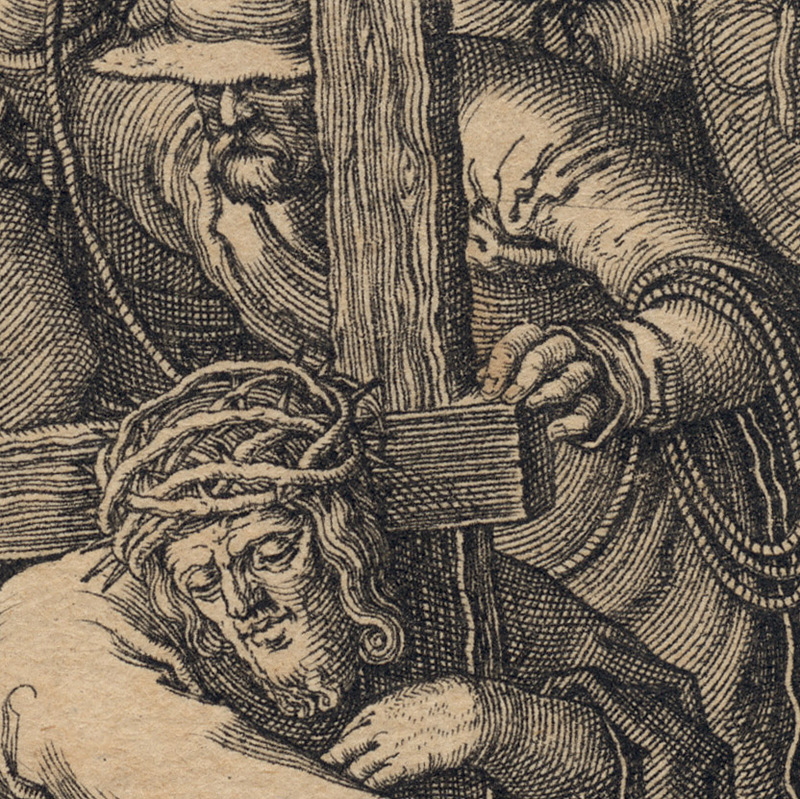 Although I fully understand the mindset of some collectors who would never consider acquiring prints reproducing other artist’s artworks, but I do not share this prejudice. 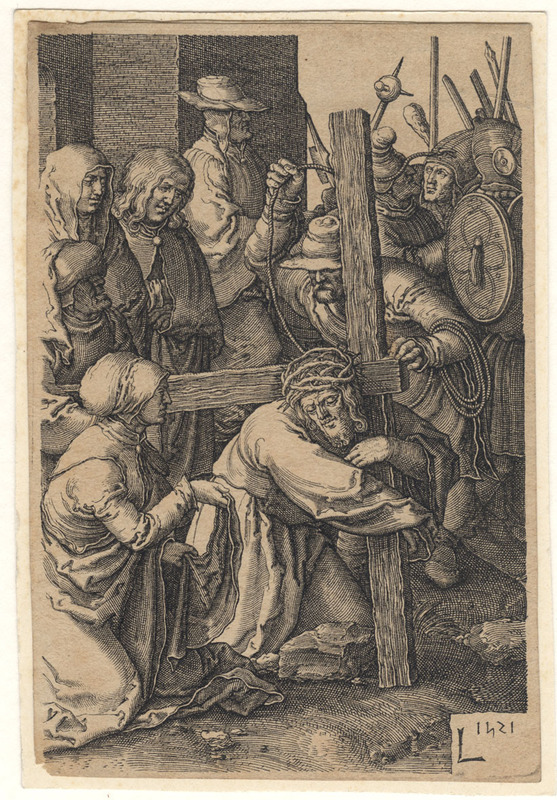 After all, I originally purchased this print by the great Flemish master printmaker, Jan Harmensz Muller, who reproduced line-by-line the engraving by the great German printmaker, Lucas van Leyden, who originally composed the image. 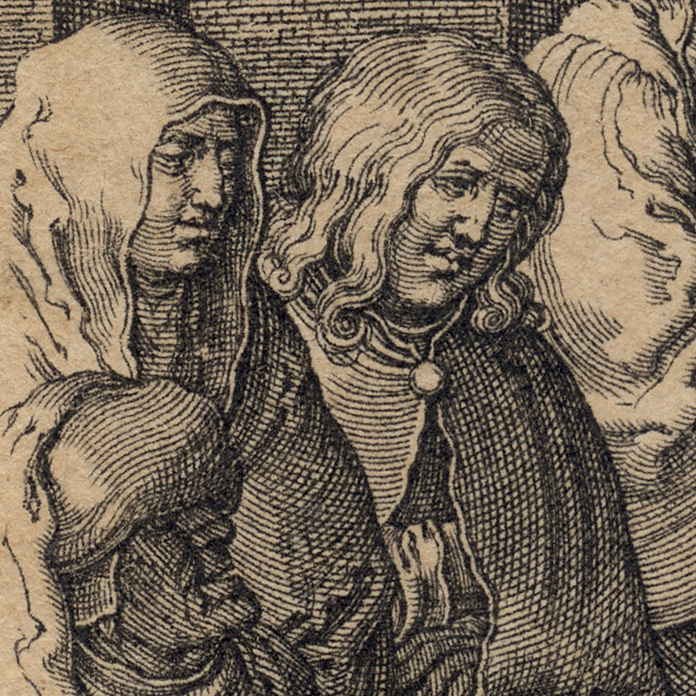 Mindful that such a choice to collect reproductive prints might be deemed an unusual passion, I thought I might try to explain very briefly why some—and I need to stress the word “SOME”—reproductive prints are worthy of respect and close examination. Regarding this print, for example, a cursory glance may not distinguish between van Leyden’s print and Muller’s copy. They are almost identical. Close examination, however, reveals that van Leyden’s print has the searching authenticity of an artist finding appropriate ways to render the portrayed subject matter in the scene, whereas Muller’s copy offers a pictorially resolved and visually lucid representation of the same forms. 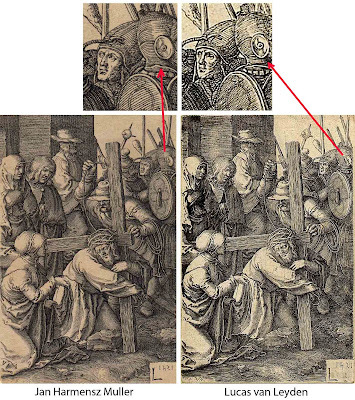 For instance, note the difference in the representation of contour strokes rendering the detail of the metal plate protecting the ear of the figure on the far right. 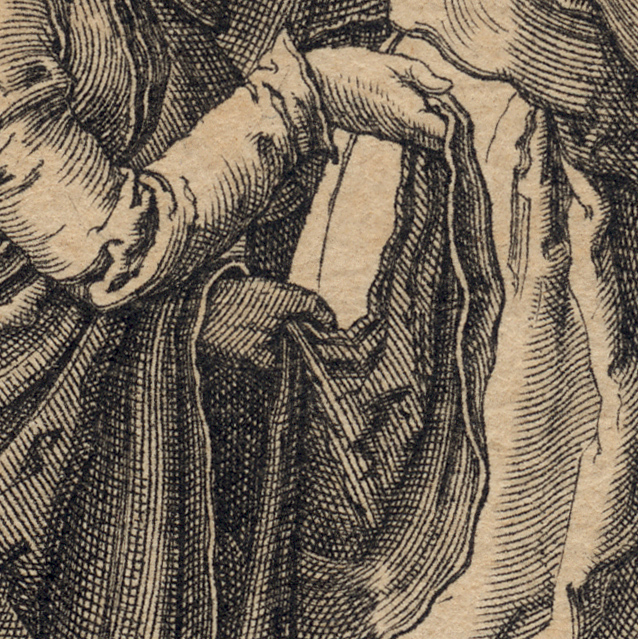 In van Leyden’s print the strokes are slightly ambiguous—sketchy—in describing this polished piece of armour. In Muller’s hands the phrasing of the lines is more resolved giving a pictorially clear representation of the metal plate’s concave contours. My way of looking at the difference between a masterwork of reproductive engraving (such as this print) and the original is all about the way that the reproductive printmaker “feels” form in each line and gives clarity to visual expression. The best way that I can explain what I mean by this curious comment is to compare the approach to drawing a chair using the principles of perspective and drawing the same chair based on the knowledge that someone should be able to sit in the chair. Both drawings may be of the same subject but the drawing executed with the notion that someone should be able to sit in the chair will be invested with that special magic of authenticity and clear communication.